Violinist Julia Li, praised by the Baltimore Sun as a performer of “confidence and brio,” has appeared extensively in recitals and concerts. She has performed as soloist with the Houston Symphony, Symphony in C (formerly the Haddonfield Symphony), and the Independence Sinfonia of Pennsylvania, among others. She has collaborated in chamber music performances with Roberto Díaz, Marcy Rosen, and Jonathan Biss; she is currently an artist with the Dolce Suono Ensemble and appeared as a guest artist with Astral Artists in Philadelphia. During her time at the Curtis Institute of Music, Ms. Li was part of Curtis on Tour’s first tour to Asia, which included chamber music performances and master classes in Shanghai, Beijing, and Seoul. Ms. Li is the youngest member of the Philadelphia Orchestra, since January of 2014. Prior to that she was a member of the Chamber Orchestra of Philadelphia and Symphony in C. She had also played with the Boston Symphony at Tanglewood. Ms. Li has spent summers at Taos, Tanglewood, Encore, and Meadowmount. For three summers she was part of the orchestra and chamber music series at the Artosphere Festival in Arkansas. She was a two-time scholarship recipient of the Dorothy Richard Starling Foundation and the National Endowment for the Arts. She has also appeared on NPR’s From the Top and Houston Public Radio’s In the Front Row.Her performance of Prokofiev’s First Violin Concerto with the Houston Symphony was broadcast on KUHF, Houston Public Radio. Ms. Li began her formal violin lessons at the age of seven in Beijing with Shengyin Huang at the Central Conservatory. After moving to the United States in 2000 she studied with Bingsun Yang and later with Kenneth Goldsmith. 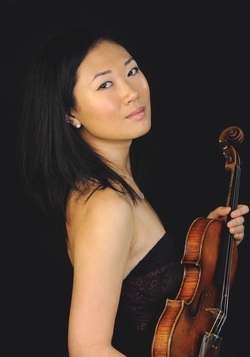 Ms. Li holds a Bachelor of Music degree from The Curtis Institute of Music, where she studied with Pamela Frank, Arnold Steinhardt, and Shmuel Ashkenasi; and she recently completed her Master of Music degree at The Juilliard School with Ronald Copes while playing her first season with the Philadelphia Orchestra. ​See this blog post featuring Ms. Li.